– Dr. James C. Halfpenny, President, A Naturalist's World and author of Yellowstone Wolves in the Wild and several more titles. 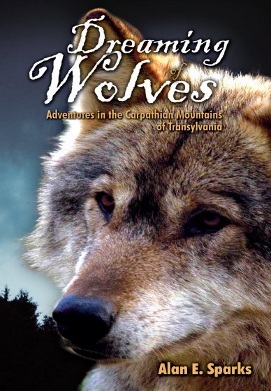 Part travelogue, part memoir, part natural and cultural history, Dreaming of Wolves presents a unique and thought-provoking story of adventure. Through a series of entertaining vignettes and informative essays, the author paints an intimate and intricate portrait of the lives of wolves, of the researchers who study them, and of the rural people who share their territory in a remote mountainous region of Eastern Europe – an exotic land that has remained largely untouched by modern trends and undiscovered by western travelers. Whether joining the narrator as he tracks wolves through the deep snows and dense forests of the Carpathian Mountains, or fends off belligerent shepherd dogs, or journeys through history to discover the real Dracula, the reader learns a remarkable amount of fascinating information about wolves, about the history and folklore of Romania, and about traditional rural life in the mountain villages of Transylvania. The story is written in an understated voice that is at once honest and humorous, deriving from events perceived with a keen and sensitive eye. The book presents several sub-themes – such as the benefits of conserving wilderness, the joy of discovering self through the pursuit of dreams, and a unique perspective on the nature of time and consciousness – all of which are woven smoothly into the fabric of a well-told story. 32 pages of color photographs and maps.